Seventeen-year-old Violet’s entire life has revolved around one thing: becoming Erica Silverman, an heiress kidnapped at age five and never seen again. Violet’s father, the best con man in Las Vegas, has a plan, chilling in its very specific precision. Violet shares a blood type with Erica; soon, thanks to surgery and blackmail, she has the same face, body, and DNA. She knows every detail of the Silvermans’ lives, as well as the PTSD she will have to fake around them. And then, when the time is right, she “reappears”—Erica Silverman, brought home by some kind of miracle. But she is also Violet, and she has a job: Stay long enough to steal the Silverman Painting, an Old Master legendary in the Vegas crime world. Walking a razor’s edge, calculating every decision, not sure sometimes who she is or what she is doing it for, Violet is an unforgettable heroine, and Pretending to be Erica is a killer debut. First Line: "I still haven't gotten used to writing my new name." Review: Pretending to be Erica was kind of a letdown. I really was hoping for a complex fast paced crime novel based off the blurb but unfortunately, it wasn't. 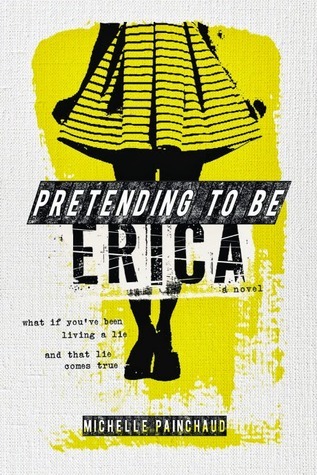 Don't get me wrong the book started off very promising, I was very curious to see how things would go when she fully became Erica, but that's when the book started to drag for me I was bored her becoming Erica and everything that followed was not very exciting and there was a lot of inner repetitive dialogue with Violet and Erica constantly clashing which just annoyed me. As far as the actual characters in the book, I didn't really connect with any of them, I felt a little sympathetic towards Violet for having to live the type of life she had but that was about it. Another thing that didn't make much sense to me was Violet and how unprepared she actually was amidst the con. She has been trained her whole life literally to take Erica's place but when she was thrown into it, you would think they just thought of the idea of doing the con recently and threw her into it untrained. Overall I think what kept me from enjoying this read was that my expectations for it were of something else than what the book turned out to be. I would say if you are looking for a light crime novel maybe check it out. ~"Anger is a fire. Passion. It's not a bad thing at all."